Hibiscus is classified as a shrub. A hibiscus tree is a shrub that has been carefully pruned from infancy to grow in the shape of a tree. The large flowers of the hibiscus provide color and attract hummingbirds to the landscape. Hibiscus is a tropical plant, it grows well outside all year in regions where the soil and air temperatures never drop below 50 degrees Fahrenheit, according to Clemson University. Transplant hibiscus during the cool season. Transplanting is stressful for any plant; high temperatures and excessive sun can wilt a stressed hibiscus. Choose your new location before digging the hibiscus out of the ground. Hibiscus like well-draining soil and full sun, though partial shade is okay. Hibiscus like a slightly acidic soil with a pH between 5.5 and 6.5, according to the University of Florida. Pick up a soil test kit at your local garden store to test the pH levels at the planting site. Drive a flat shovel straight down into the soil all the way around the rootball. To determine the size of the rootball, measure the base of the trunk. For every inch of trunk diameter, move the shovel 12 inches from the base of the trunk. The total rootball will be 24 inches in diameter if the trunk is one inch around. Go to the new planting site and dig a hole that is one foot wider than the circle you dug around the root ball. Loosen the soil in the bottom of the planting hole. 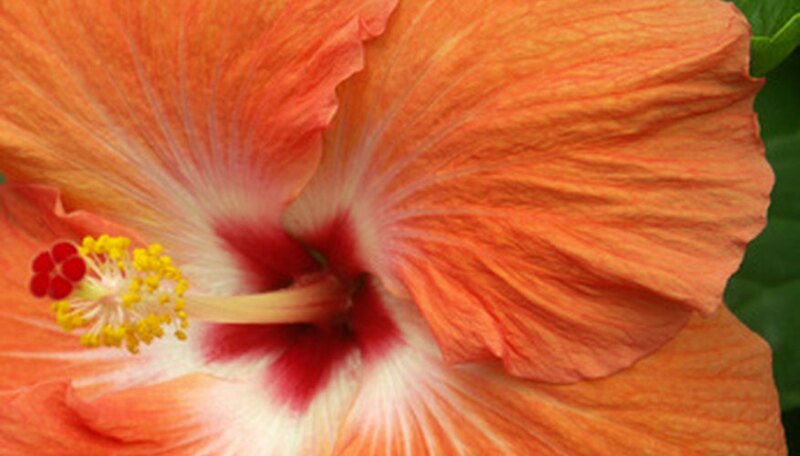 If you are transplanting more than one hibiscus to the same area, space holes at least five feet apart. Return to the hibiscus tree and dig out the rootball. Drive your shovel into the soil and lift up to loosen the roots. Repeat this as you move around the hibiscus. Get a few helpers and drive shovels into the soil at three or four points around the rootball, and lift up slowly until the roots come free from the soil. Dig down at least 12 inches. When lifting the rootball from the ground, try to keep as much of the soil around the roots as possible. Put the hibiscus tree into the new planting hole. The base of the trunk should be level with the surrounding soil. You don't want to plant it deeper or more shallow than it was at its previous site. Fill the soil in around the rootball a few handfuls at a time. Pat the soil down and dampen it with water as you go. Press out any air pockets by pushing soil into any empty spaces. Water the area until the soil is damp all the way through. Keep the soil thoroughly damp for the first two weeks after transplanting. After the hibiscus is established, water weekly and let the roots dry out in between. If you live in a northern climate, plant your hibiscus in a pot and bring it inside for the winter season. In the spring, when the temperatures are consistently above 50 degrees Fahrenheit, move your hibiscus outside. Try sinking the whole pot into the soil; you will get the effect of an established hibiscus all summer and in the fall you can dig up the pot without disturbing the root system. If you do have to transplant during the hot season, choose a cloudy day or transplant late in the afternoon or early evening. How Can I Get Squirrels to Stop Eating My Hibiscus Plants?